Exercise! You might not feel like it because of your symptoms, but moving will get your blood flowing. This not only helps you stay healthy, but the nerves in your feet, too! 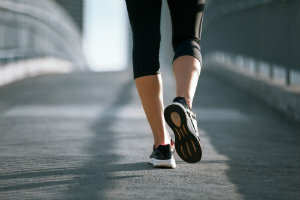 Your blood is what brings damaged nerves the healing nutrients they need to repair themselves, so even if it’s just going for a walk, make a plan to get some exercise each day. You can try physical therapy, as well. We’ll be happy to help you with this if you like. Refrain from smoking and limit drinking alcohol. These can negatively affect both your circulation as well as your eating habits. Eat a healthy, nutritious, and well-balanced diet. Enjoy a foot massage. Not only is this relaxing, but it also stimulates circulation. Ask about medications and other treatments. There are prescription medications that can help ease discomfort, as well as manage underlying conditions, such as diabetes, that could be the reason for the nerve damage in your feet. Laser therapy is another option that can relieve the burning, tingling, numbness, and pain by blocking the pain messages being sent to your brain, and boosting the healing process of your damaged nerves. If your chores have become a chore and your fun activities are no longer fun, contact us for help in managing neuropathy symptoms. You can reach our Palm Desert, CA office by dialing (760) 568-0108, or by using our online contact form. We’ll help make your nerves happy again so you can be too!